specially the upper part Axis money and X-axis quantity. A consumer has OP’ amount of income which he spends on good ‘X’ that means his budget line is PA and he is on indifference . 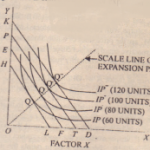 enee curve ‘IC’ at point ‘a’ like this as price of ‘X’ decreases, a consumer’s budget line shifts from ‘OA’ to ‘Oll”, ‘OC’ and ‘OD’, in the same way consumer moves on to higher indifference curves and they arc tangent to their respective budget line. In IC2• IC1 and IC4 are tangent to budget line. ‘PI3’, ‘PC’ and . ‘PO’ at point ‘h’, ‘c’ and ‘d’. 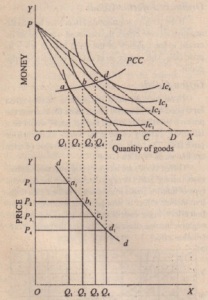 When we join all these points we get ‘PCC’ curve that is ‘Price Consumption Curve’. 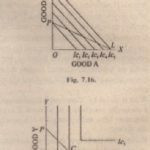 In the lower figure we take Y-axis as price, and X-axis as quantity demanded, when we draw per pendicular lines wc get points ‘a.’, ‘b.’, ‘c.’ and ‘d.’, which shows relation between price OPI, 01’2′ OP) and 01’4 and the corresponding demand curve. to his price consumption curve for that good. In fact, both give the same information except that the former gives it directly and in a more useful form. The way in whieh ordinary demand curve can be. drawn from price consumption curve is cxplain-d with the help of Fig. 7.10. 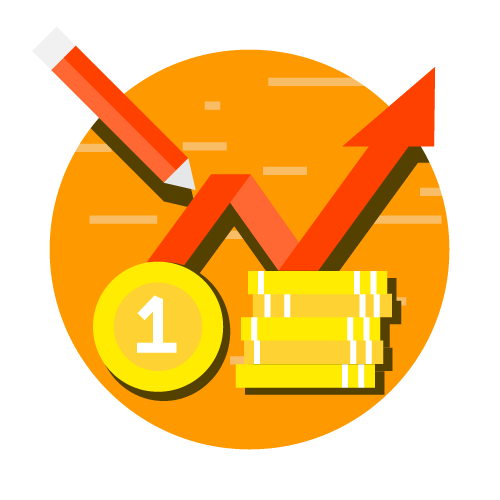 When a demand curve is t., be drawn, units of money are measured on one axis, while amounts of a good for which demand curve is to be drawn arc shown on the other axis. In the above diagram, the units of money arc shown on the Y-axis and the commodity A. for which the demand curve is to be drawn. is shown on the X-axis. Suppose a consumer has a daily income of 240 P.! 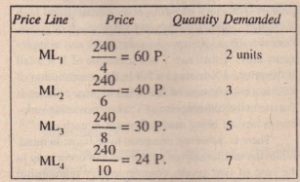 If the price of commodity 1\ is 60 P. per unit, the relevant price-income line will he ML, because, at this price. 4 units can he purchased with 240 Paise. The consumer will be in equilibrium at the point PI uf the price consumption curve PCC. because at this point the price line ML, is tangent to the indifference curve C,’ and will buy or demand 2 units of the commodity . Suppose the price falls to 40 P. The relevant price line becomes MLz (because now 6 units can be purvhased with 240 Paise). Now tile consumer will be in equilibrium at point 1′, of the price consumption curve on a higher indifference curve C2 and will buy 3 units. Similarly. the consumer will buy 5 units or the good when price is 301′, and 7 units when price is 24 1. With the above information, we can draw up the demand schedule of a consumer as follows. Table I: individual’s Demand Schedule. Now we can easily c convert this demand schedule into an ordinary demand curve. By plotting the points like. By joining these point. with a continuous curve, we get the usual demand curve of the consumer for the commodity A. We see that the demand curve drawn slopes downward fun left to right as usual. This is the typical shape of the demand. We have taken daily income, and the demand curve which we shall draw will show the demand of the consumer for the good per day. Demand is always with reference to a certain period of time. one commodity outside the group of completes, at whose expense the substitution favor of tire group of complement can occur. In Ruth r words out of a given number of commodities in a consumers budget, at least one of them substitute for them while all other may be complements of each other. This one extreme limit of eccentricity The other extreme limit is use where there may be no complement present at all. i.e.. all good are substitutes fur each other.